As the National Bouldering League kicks off in various cities around the country, the Western Cape is first out the gates with it's opening event next week Tuesday! 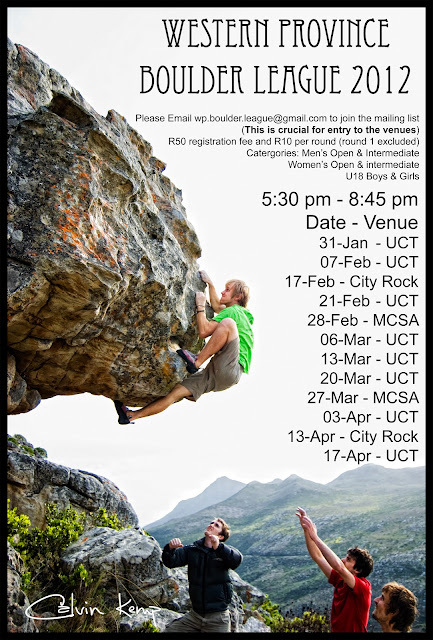 This year The Cape will see 12 rounds of bouldering hosted at UCT, CityRock and MCSA. As with previous years the idea is two fold, find the strongest climbers in the Western Cape to represent the province at Nationals and to get everyone together to have as fun as possible. This year will see a few additional setters as well as some of the old ones to provide a wide selection of problems each week for all climbers to enjoy. Each round consists of 15 problems marked with a halfway point and a finish point, points will be awarded for reaching theses marks. We want boulder league to include everyone thus the problems are set so that they progress in difficulty but still allowing everyone a chance at sending. You have the whole session (5:30pm - 8:45pm) to work the problems and get up as many as possible. Please see below for details of the league including all the dates, venues, categories and costs. If you, or anyone you know, are keen to join the league, please join on our mailing list. NB: It is essential that you are on the list so that you are granted access to the venues.